We all know that smoking is bad for our health, but do we ever wonder how dangerous it exactly is? Smoking is restricted or banned in almost all public places. Cigarette companies are no longer allowed to advertise on TV, radio and in many magazines. Nowadays, everyone knows that smoking causes cancer, emphysema and heart disease, it can shorten one’s life by 10 years or more and that the habit can cost a smoker thousands of dollars a year. However, people are still lighting up because of the addiction they gradually developed and which is so hard to get rid of. 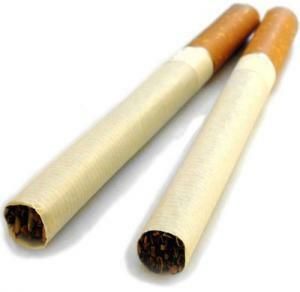 The most prominent chemical found in cigarettes is nicotine. Nicotine produces all the good feelings that draw people back for another cigarette. Smoking makes people feel good and mildly enthusiastic. Like any other addictive drug, nicotine causes changes in the brain, so that the consumer needs more and more of it. The brain quickly adapts to these pleasant feelings, so that a person needs to have a daily dose just to feel normal. In addition, nicotine, just as any other addictive drug, causes unpleasant withdrawal symptoms, which makes breaking of the addiction very difficult. There are so many chemicals in a single cigarette that it makes it impossible to list them all in this article. It is estimated that an average cigarette contains approximately 12.000 different chemicals. Tobacco smoke alone contains over 4,000 different chemicals. This is why there is a severe health concern associated with second-hand smoking. Many of these chemicals are poisonous, and around 50 of them are known as carcinogens – chemical compounds able to trigger cancerous diseases in humans. Here is the quick review of some chemicals contained in a cigarette. Tar is the most destructive component in habitual tobacco smoking. Tar is a particulate matter produced by the burning of tobacco in the process of smoking. It gets accumulated in the smoker’s lung, damaging them gradually. Tar also damages the mouth by rotting and blackening the teeth, damages the gums and blocks the papillae and taste buds and the eye's vision. Lead, Cadmium and Nickel are poisonous substances found in the cigarette smoke. Cadmium may cause cancer in humans while Nickel causes respiratory problems. Benzene is another carcinogen found in cigarettes. About 50% of the entire nationwide exposure to benzene results from smoking tobacco or from exposure to tobacco smoke. Benzene damages the bone marrow, lowering the red blood cells and triggering anemia. Benzene causes leukemia and is associated with other blood cancers and pre-cancers of the blood. Formaldehyde is associated with the development of leukemia, particularly myeloid leukemia. Carbon Monoxide is a highly poisonous gas that reacts with hemoglobin and reduces oxygen supply to the living cells. Carbon Monoxide also lowers the capacity of smoker’s lungs. Arsenic, which is found in cigarette smoke, is actually a lethal substance used as a rat poison. How Long Is Nicotine Traceable In The Body?